Thrust into the unlikely role of professional 'literary walking tour' guide, an expat writer provides the most irresistibly witty and revealing tour of Paris in years. 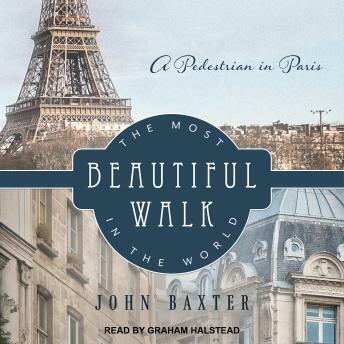 In this enchanting memoir, acclaimed author and long-time Paris resident John Baxter remembers his yearlong experience of giving 'literary walking tours' through the city. Baxter sets off with unsuspecting tourists in tow on the trail of Paris's legendary artists and writers of the past. Along the way, he tells the history of Paris through a brilliant cast of characters: the favorite cafes of Ernest Hemingway, F. Scott Fitzgerald, and James Joyce; Pablo Picasso's underground Montmartre haunts; the bustling boulevards of the late-nineteenth-century flâneurs; the secluded 'Little Luxembourg' gardens beloved by Gertrude Stein; the alleys where revolutionaries plotted; and finally Baxter's own favorite walk near his home in Saint-Germain-des-Pres. Paris, by custom and design, is a pedestrian's city-each block a revelation, every neighborhood a new feast for the senses, a place rich with history and romance at every turn. The Most Beautiful Walk in the World is your guide, par excellence, to the true, off-the-beaten-path heart of the City of Lights.